mGRE | CCIE, the beginning! – GRE (Generic Routing Encapsulation) IP protocol 47 is a tunneling protocol that encapsulate any network layer packet. GRE provide the possibility to route IP packets between private IP networks across public networks with globally routed IP addresses. GRE is a unicast protocol hence the big advantage of encapsulating broadcast, multicast traffic (multicast streaming or routing protocols) or other non-IP protocols, and being protected by IPSec that doesn’t support unicast. Figure1 depicts the physical topology on which point-to-point GRE tunneling is configured. 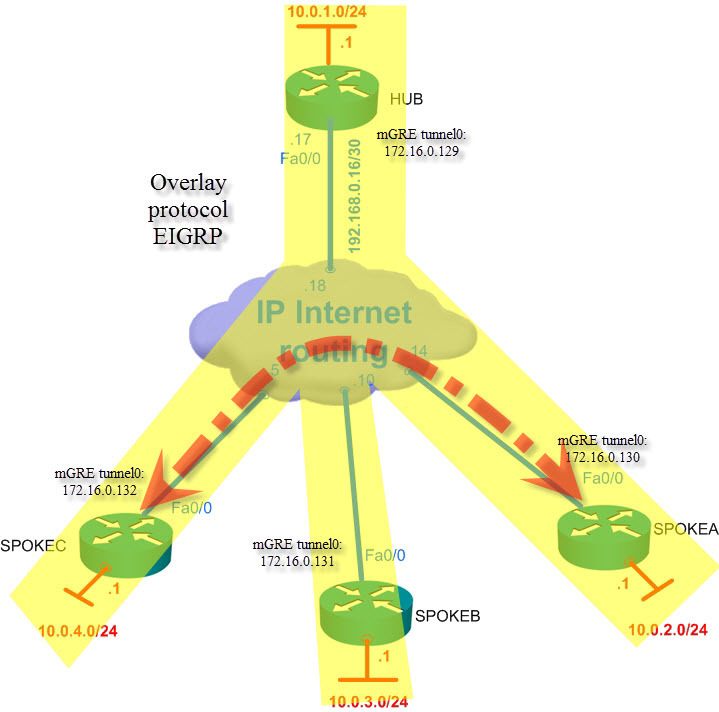 Note that OSPF is not enabled over the interface facing the public network with routable IP (172.16.0.0/16 for the purpose of the lab), but over tunnel interfaces; and the default OSPF mode is point-to-point which match the GRE tunnel mode. Received Inter-area routes point to tunnel interfaces and reachable through the other side of GRE tunnels. Figure2 depicts the Frame Relay topology on which multipoint GRE tunneling is configured, multipoint GRE operates at the network layer, nevertheless the layer3 topology must be consistent with the layer below, where Frame Relay operates and where PVC are strictly configured and mapped to NBMA addresses. At this point you cannot miss the fact that it is not possible to set in advance the tunnel destination interface (GRE destination address) for multipoint GRE, here resides the concept of mGRE: one interface that ends multiple tunnels; hence the need for a mechanism that will identify the remote peer’s tunnel end point ip address in advance, NHRP (Next Hop Resolution Protocol). So each spoke NHRP starts registering itself by forming a tunnel with the HUB, the destination interface is taken from the previously configured static map. Finally the concept is very similar to the mapping in Frame Relay where a destination NBMA IP (layer3) is mapped to a DLCI ( PVC, layer 2) either statically or dynamically through inverse ARP. Once resolved each Spoke forms a tunnel with the HUB, here comes the routing protocol, OSPF is announced on tunnel interfaces, so adjacency relationships will be formed with the HUB, it is important to tell routers that broadcast and multicast will be sent to the HUB, so they could exchange routing information. Though the routing information between spokes is exchanged through the router, routing information populated in routing tables points to logical addresses (tunnel IP’s) and the NBMA addresses still unknown. mGRE needs to resolve the NBMA destination address; spokes ask the HUB (NHS) what NBMA address correspond to a particular tunnel (logical) IP, the HUB respond from its NHRP records, the spoke use the obtained NBMA address as a destination and communicate directly with the destination spoke. The following command instruct spokes where to forward the NHRP requests, if not specified the spoke will take the next-hop from the routing table. ip nhrp network-id <number> Logical NBMA cloud to which the interface belongs. ip nhrp interest <ACL> Tells the router when to send NHRP requests. ip nhrp used <number> Send NHRP requests when there are certain number of packets for a destination. ip nhrp map multicast <remote_NBMA_desti_IP> Broadcast/multicast will be sent to a particular end- point of the tunnel. ip nhrp nhs <x.x.x.x> network <network> Statically configure NHS, otherwise NHRP will follow routing information that will point to a HUB. 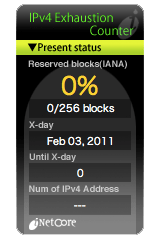 ip nhrp max-send <packets> every <time- interval> Control the maximum rate of NHRP messages sent, by default 5 packets every 10 seconds. ip nhrp responder <inttype X/X> Set the source address of NHRP server replies. ip nhrp holdtime <sec> <sec> Lifetime of NHRP information, default 7200sec (2 hours) for negative and positive responses. Make sure that tunnel key match with all routers participating in the same mGRE. When using OSPF make sure that you announce networks through the tunnel interfaces and that the OSPF network mode is either broadcast or point-to-multipoint, not the default point-to-point. With EIGRP make sure that you disabled split-horizon.